Xylitol ... Our Sweet Salvation? /Xylitol ... Our Sweet Salvation? By Dr. Sherrill Sellman, N.D.
Xylitol is not only a safe, natural sweetener without the bad side-effects of sugar and artificial substitutes, it’s also good for your teeth, stabilizes insulin and hormone levels, and promotes good health. It seems that we just can’t get enough of sugar. On average, a half a cup of sugar is consumed per person every day. Never in modern history has a culture consumed so much sugar. Sugar truly does deserve its reputation as a “white poison”. Thinking of sugar as a food is really a stretch of the imagination, because it is more a chemical that is difficult for our bodies to utilize and digest. Humans were really not designed to eat large amounts of sugar in whatever form it may take: white and brown, corn syrup, sucrose, dextrose, glucose, fructose, lactose, maltose, barley malt, honey, rice syrup, and maple syrup. Sugar is also highly seductive, acting as an addictive drug that lures even the most well-intentioned person back into its sweet clutches. But regularly eating large amounts of sugar will cause serious harm! Sugar can cause hypoglycemia and weight gain, leading to diabetes and obesity in both children and adults. It leaches the body of vital minerals and vitamins. It raises blood pressure, triglycerides, and the bad cholesterol (LDL), increasing the risk of heart disease. It causes tooth decay and periodontal disease, which leads to tooth loss and systemic infections. It makes it difficult for a child’s brain to learn, resulting in a lack of concentration. Both children and adults exhibit disruptive behavior, learning disorders, and forgetfulness from sugar consumption. It initiates auto-immune and immune deficiency disorders such as arthritis, allergies, and asthma. It also upsets hormonal balance and supports the growth of cancer cells. So what are we to do? Will our sugar cravings always hold us hostage, or is there really a way to kick the sugar habit successfully? During World War II, Finland was suffering from an acute sugar shortage. With no domestic supply of sugar, the Finns searched for an alternative. It was then that the Finnish scientists rediscovered xylitol, a low-calorie sugar made from birch bark. It had, in fact, been known to the world of organic chemistry since it was first manufactured in 1891 by a German chemist. By the 1960s, xylitol was being used in Germany, Switzerland, the Soviet Union, and Japan as a preferred sweetener in diabetic diets and as an energy source for infusion therapy in patients with impaired glucose tolerance and insulin resistance. Since then, many other countries, including Italy and China, have been producing xylitol for use in their domestic markets and with remarkable health benefits. It has been relatively unknown in the U.S.A. and Australia, primarily because cheap supplies of cane sugar made the more expensive xylitol less economically viable. Xylitol is a natural substance found in fibrous vegetables and fruit, as well as in corn cobs and various hardwood trees like birch. It is a natural, intermediate product which regularly occurs in the glucose metabolism of man and other animals, as well as in the metabolism of several plants and micro-organisms. 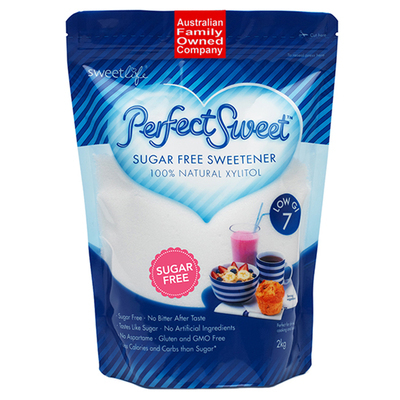 Perfect Sweet xylitol is available in Australia. Xylitol is produced naturally in our bodies; in fact, we make up to 15 grams daily during normal metabolism. Although xylitol tastes and looks exactly like sugar, that is where the similarities end. Xylitol is really sugar’s mirror image. While sugar wreaks havoc on the body, xylitol heals and repairs. It also builds immunity, protects against chronic degenerative disease, and has anti-aging benefits. Xylitol is considered a five-carbon sugar, which means it is an antimicrobial, preventing the growth of bacteria. While sugar is acid-forming, xylitol is alkaline enhancing. All other forms of sugar, including sorbitol, another popular alternative sweetener, are six-carbon sugars,which feed dangerous bacteria and fungi. Approved by the U.S. Food and Drug Administration (FDA) in 1963, xylitol has no known toxic levels. The only discomfort that some sensitive people may notice initially when taking large amounts is mild diarrhea or slight cramping. Since the body makes xylitol daily, as well as the enzymes to break it down, any discomfort usually disappears within a few days as the body’s enzymatic activity adjusts to a higher intake. Xylitol has 40% fewer calories and 75% fewer carbohydrates than sugar and is slowly absorbed and metabolized, resulting in very negligible changes in insulin. About one-third of the xylitol that is consumed is absorbed in the liver. The other two-thirds travels to the intestinal tract, where it is broken down by gut bacteria into short-chain fatty acids. Xylitol looks, feels, and tastes exactly like sugar, and leaves no unpleasant aftertaste. It is available in many forms. In its crystalline form, it can replace sugar in cooking, baking, or as a sweetener for beverages. It is also included as an ingredient in chewing gum, mints, and nasal spray. 1. Zeines, Victor, DDS, MS, FAGD. Healthy Mouth, Healthy Body. Kensington Publishing Corporation, 2000, p. 55. 3. Beiswanger, BB, Boneta AE, Mau MS, Katz BP, Proskin HM, Stookey GK. The effect of chewing sugar-free gum after meals on clinical caries incidence. J. Am. Dent. Assoc. 1998;129:1623-6. 4. Hayes, Catherine, DMD; DMSc. The effect of non-cariogenic sweeteners on the prevention of dental caries: A review of evidence. Harvard School Of Dental Medicine. See the http:// www.lib.umich.edu/dentlib/nihcdc/abstracts/hayes.html Internet website. 5. How Xylitol-containing Products Affect Cariogenic Bacteria. J. Am. Dent. Assoc., April 2000. 6. J. Am. Geriatrics Soc. 2002;50. See the www.globalaging.org/health/world/ medgum.htm Internet website. 7. Luotonen M, Uhari M, Aitola, L et a1. Recurrent otitis media during infancy and linguistic skills at the age of nine years. Pediatr Infect. J. 1996;15:854-8. 8. Bennett KE, Haggard MP, Silva PA, Stewart IA. Behavior and development effects of otitis media with effusion into the teens. Arch. Dis. Child 2601 Aug;85(2):91-5. 9. See www.nasal-xylitol.com Internet website. 10. Svanberg M; Mattila P, Knuttila M. Dietary xylitol retards the ovariectomyinduced increase of bone turnover in rats. Calcif. Tissue Int. 60:462-466. 11. Mattila P, Svanberg, M, Knuttila, M. Increased bone volume and bone mineral content in xylitol-fed aged rats. Gerontology 2001;47:300-305. 12. Carbohydrates: The Good, the Bad, and the Ugly. Dr. James Whittaker Newsletter, vol. 13, no.4, April 2000. 13. John, Lee MD. What Your Doctor May Not Tell You About Breast Cancer. Warner Books, 2002, p. 61.